Despite larger and louder movements against guns and gun violence, gun ownership in Michigan is on the rise, and with it, lots of new ranges and gunshops. Northern Express sends an amiable (and non-gun-owning) reporter to see what all the fuss is about. The 9mm pistol fit in my hands like a puzzle piece, making it easier to fire nine shots in about 30 seconds. The paper target with a large red diamond in the middle — 10 feet away — was riddled with holes, only a couple of shots landing close to where I was aiming. After the first round of shooting, my instructor, Elsie Cunningham, asked if I would like to move the target. “Let’s go for murder,” I suggested, as I reloaded the gun’s clip. I should have kept it at 10 feet, because my shots became even more sporadic. But this just encouraged me to purchase another box of bullets and spend more time at the gun range, trying to improve my accuracy. It was my first time at Shooters, an indoor gun and archery range located on the south side of Traverse City. Shooters offers customers the opportunity to rent firearms ranging from Glocks to AR 15s and shoot them on-site. The shooting range — which also includes a sports store — has been open since 2011 and, like many other ranges, it has only grown in popularity. Despite increasingly vocal movements against guns and gun violence across the nation, gun ownership in Michigan is on the rise, and with it, new ranges are popping up and old ones are seeing improvements. In 2016, Michigan ranked fourth in the nation for number of user days spent at shooting ranges — both public and private, according to Lori Burford, Department of Natural Resources shooting range specialist. Cunningham, a 24-year-old law enforcement student at Northwestern Michigan College, has worked at Shooters for about a year and a half. She loves her job because she gets to see all sorts of guns. She wore blue jeans with a snug, red cotton T-shirt emblazoned with the United States Marines logo, perhaps an homage to her father, a former marine, and her fiancé, who is currently serving. On her necklace were several silver charms, including a pair of tiny handcuffs, and in her right nostril she sported a golden stud piercing. She smiles a lot and becomes animated when she talks about her passion for firearms. She has had her CPL since she turned 21 years old, the minimum age, and carries a Smith & Wesson M&P .45 Shield whenever she can. Working at a gun store and shooting range, Cunningham sometimes encounters overbearing male egos from customers, she said. Shooters is just one of about 383 ranges throughout Michigan, according to the DNR. The newest range in Grand Traverse County is located on Supply Road, but is currently closed for the winter. The almost $1 million outdoor facility opened in September 2018 and has 12 stations for target shooting — three each, at 10, 25, 50 and 100 yards. The DNR had a vehicle counter at the site Oct. 18–21. The counter read 102 cars for that weekend. Between November 11–18, there were 190 vehicles counted. “Folks want to see some longer distances and some handgun shooting opportunities,” Burford said. John Hampel is a fourth generation owner of a Traverse City family-run business that has recently spilt into two separate companies — a gun store and a lock business. The company turns 100 years old this year. Currently, Hampel owns the safe and lock shop and hasn’t had anything do with the gun-side of the operation for several years, which recently sold to Rodrigo Meirelles. Hampel said he is not the voice of the gun business: However, he is pro-gun and a NRA supporter. According to a Jan. 2, 2019 Michigan State Police report, 644,607 CPL applications were approved throughout the state, including 5,494 In Grand Traverse County; 1,666 in Kalkaska; 1,283 in Leelanau; 2,266 in Emmet; 1,909 in Otsego; 2,594 in Wexford; 1,881 in Antrim and 1,856 in Charlevoix. Michigan State Police Lieutenant Travis House said ranges offer a safe place for gun enthusiasts to shoot. According to the lieutenant, there have been cases in the past where shooters didn’t take the correct precautions when target practicing in their backyard. Target practicing in a backyard isn’t “necessarily illegal,” Lieutenant House said. It all depends where the residence is located and what the zoning ordinances are. Hunters must comply to a 450-foot safety zone around buildings, but this does not apply to target shooters, according to the DNR. 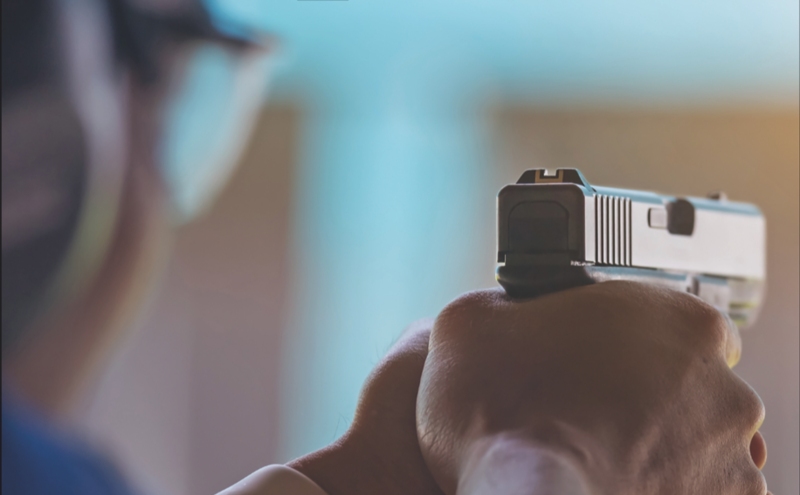 If a law enforcement officer receives a backyard target shooting complaint, the officer will see if there is an adequate berm in place and if there is a potential for danger. Lieutenant House said there is a necessity for gun ranges, for both private and government users. The public is not required to log any time at a gun range to own a firearm, but it is mandatory that the Michigan State Police conduct gun training at least three times a year. The Gaylord post utilizes the Otsego Sportsman’s Club or Camp Grayling. Other police posts either use nearby public or private ranges, like the Cadillac range, which is only open to law enforcement. He also said there is a recreation value to ranges. “Often times these clubs are not only a place to practice, they will also hold competitions or sanctioned NRA events,” Lieutenant House said. There are more than 1.25 million target shooters in Michigan, according to a recent report on shooting sports participation, prepared for the National Shooting Sports Foundation by the National Sporting Goods Association. In a report on the 15-year history of shooting sports participation, the foundation found that, nationally, from 2001 to 2015, the number of people who participate in target shooting increased 28 percent overall and, among women, 64 percent. However, Lieutenant House doesn’t subscribe to the idea that if you build it they will come. “If you are thinking if we build a whole bunch more gun ranges, then a bunch more people will buy guns to go use the gun ranges, that seems opposite of what is happening. It is driven by a need,” he said. Burford said according to the National Shooting Sports Foundation, 2015 was the highest recorded year for firearm sales nationwide. Don Kline is the owner of Hot Shot Firearm Restoration in Petoskey. He has been doing firearm restoration for the past 10 years, but on Jan. 2, he opened a new expanded store that has been filling a void in the area after MC Sports closed. His store does not have a gun range, but he does sell firearms and other sporting goods and has an archery simulator. Kline said politics and “fear mongering” have helped his gun sales the most. According to a CNBC study using Kensho, Sturm Ruger and American Outdoor Brands rise 1.6 percent and 2.2 percent, respectively, five days after a mass shooting. The study looked at the companies’ stock market performance following mass shootings dating back five years. Cunningham said Shooters’ sales seem to spike at random times and rely more on word of mouth about what firearms are popular. A lot of the store’s gun sales are smaller firearms, like Glocks. She added that customers want something smaller to carry on their person. When it comes to purchasing guns online, Kline said stores like his are essentials for Internet transfers. As a Federal Firearms License holder, he is able to do a background check and complete the required Bureau of Alcohol, Tobacco, Firearms and Explosives Form 4473. Kline refers customers to Wildwood Shooting Range, which also does tactical shooting training. Kline is contemplating starting his own simulator handgun range that will utilize CO2, rather than bullets. He said having a gun range nearby is not only beneficial to the economy, but also to the community. As a young boy, he remembers learning how to shoot from his father, who would take him to a .22 shooting range in the basement of a community center in Midland, Michigan. In 2015, the DNR was awarded $4 million through the Pittman-Robertson Fund for the expansion and development of shooting ranges. The Supply Road range benefited from the grant and received partial funds for its development. The Pittman-Robertson Fund comes from an excise tax on firearms and archery equipment that’s used for various projects related to wildlife and conservation, as well as shooting programs. The federal funds are allocated to each state depending on the number of hunting licenses sold and the amount of public lands available for use. Each year the allocated funds vary, Burford said. “We are seeing a great increase in the number of firearms being purchased, so what this means is this excise tax is increasing so there are more funds available to each state,” Burford said. All told, about $7 million over a five-year period has been allocated to Michigan to develop and improve both private and public shooting ranges, said Burford. However, the Detroit Free Press reported that in 2017 about 621,000 hunters bought licenses, down 21 percent from 785,000 deer hunters in 1998. That decrease is expected to continue, according to an analysis by Michigan Technological University. Ultimately, the decrease could affect the amount of funds the state will receive in the future from the Pittman-Robertson Fund. In March 2018, the DNR received another grant from the Pittman-Robertson fund for $1.25 million over a five-year period to provide up to 75 percent of funding for improvements to partner shooting ranges throughout Michigan. Some of the funds have already been awarded to selected ranges in need of updates, including the indoor range at Michigan Tech and Ogemaw Hills Sportsmen Association. “The use is there, so we just want to make sure we are providing good, safe fun opportunities for people to go out and shoot,” Burford said. After 100 rounds and two paper targets, I spent a little more than an hour at Shooters indoor gun range, which is about the size of a basketball court with a mound of shredded tires at one end, and brass casings strewn at the other end’s floor. I can’t say my accuracy improved much, but my instructor was encouraging. "You did great," she said. "Shooting at 10 feet and shooting at 22 feet are two different things." Overall by the end of the session, I felt safer handling a pistol. It didn’t seem so intimidating, with all of its movable parts. I am unlikely to purchase a handgun any time soon now, but I know that next time I’ll be upgrading my target to a zombie pizza delivery man — just one of many creepy targets for sale at the store.